I read this article and found it very interesting, thought it might be something for you. 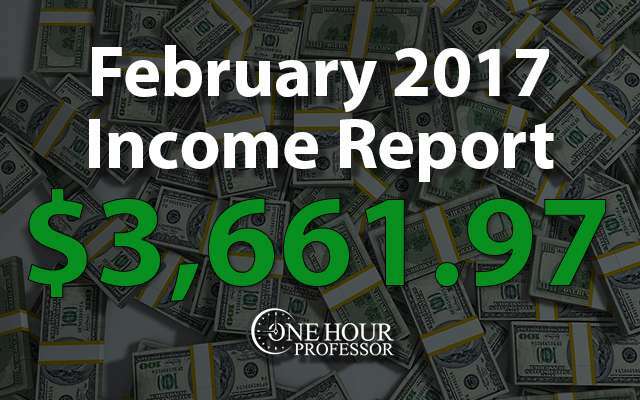 The article is called February 2017 Monthly Income Report and is located at http://www.onehourprofessor.com/february-2017-monthly-income-report/. The shortest month of the year is now behind us and I am really happy with how well this year has gone so far. Last year at the end of February my business income was $3636.33, but this year it’s at $7102.40. That’s an increase of about 95% year over year and an awesome trend that I hope I can follow each year moving forward. Considering the fact that it was a short month and that I took a week off, this month was very good and I’m very excited about what the future will hold for my online businesses. 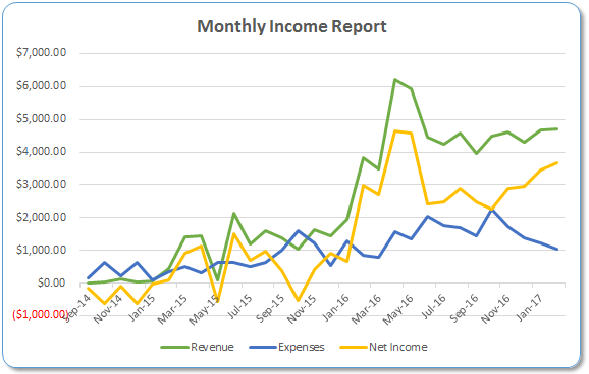 Before I begin the income report, if this is your first time on my website let me explain why I write a detailed income report each month that outlines the money I made (or lost) each month. Every month I have income that streams in from multiple sources and quite frankly, a lot of that is pretty regular. However, each month I tend to see a few line items that are drastically different from the prior month. In this section, I’m only going to discuss the items that have increased or decreased significantly. Lynda.com Affiliate Sales: To be completely honest, I’m not really 100% sure where these affiliate sales came from. I think it is from the JobsForFelonsHub website, but it’s also possible that it came from one of my new authority websites. I corrected the issue so that I can assign attribution more clearly in the future, but I’m hopeful that it’s the new authority website. If it is, I definitely found a new form of income for that website that I wasn’t expecting. We’ll see if this is repeated next month and then I’ll go from there. 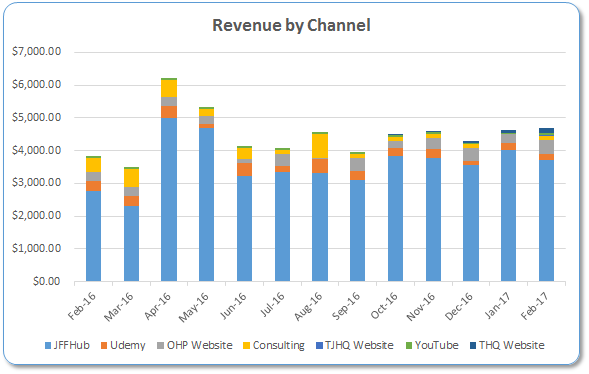 OHP Course Sales: I was pleasantly surprised to see that I made two sales this month of my flagship course about creating a successful online business. This is nothing more than luck on my part as I didn’t change my approach to getting customers. I have no plans to focus on my courses still, but this was a nice surprise. Thrive Themes: I’ve said it time and time again, but I absolutely love this product/software. In February, they released Thrive Quiz Builder (You can find the tutorial here). This is an amazing plugin that allows you to drive email signups by having people take a quiz and I feel like this strategy has a lot of potential. Anyway, the cool thing about this new plugin is that I was one of the first to write about it which ended up increasing my affiliate income this month. Legal Shield: This last month I spent a lot of time and money properly incorporating my business into a single-member LLC. I didn’t include these expenses (which totaled around $1200) into my income report because it would have thrown everything off when comparing this month to other months. That being said, one of the biggest things I struggled with was figuring out how to properly create an LLC and transition my websites to be covered under the LLC. I was stressing about getting a lawyer when a good friend of mine explained how one of my favorite new services works called Legal Shield. Long story short, this service allows you access to a legitimate local lawyer for a fraction of the typical cost. As of now, I am paying $29.00 per month for this service and can call them as many times as I’d like throughout the month with legal questions. The law firm I am in contact with has been around for over 10 years and is extremely good at what they do. Further, they will represent me in the case that I have to go to court for a lawsuit and will also write legal letters on my behalf if I need it. I personally think this service is a godsend for online entrepreneurs with legal questions and will be posting more about it soon once I’ve worked with them for a few weeks. As of now though, my initial impressions are excellent and after getting some questions answered about setting up my LLC, I am confident this is an awesome service. App Sumo Serpstat: This was a one-time cost I incurred for buying lifetime access to an SEO analysis tool called Serpstat. It was a deal on App Sumo and though I know it isn’t as good as other tools out there (Like Ahrefs), you never know how much it will grow in the future and if it will become the market leader. Plus, Ahrefs is $99/month and this one was a one-time fee of $49 for lifetime access, so that’s hard to beat. Fiverr: The last expense outlier this month was for a logo designed on Fiverr. I’ve partnered with a longtime friend to create a news website in a specific niche and this is where these costs came from. This new business is a 50/50 split for expenses and income. She will handle more of the day-to-day work and we will then strategize together for the larger decisions of the business. JobsForFelonsHub.com Update: Okay so I FINALLY started to optimize JFFHUB for extra revenue in February, but then I stopped. The reason is that I’m trying to use Ezoic to optimize earnings and have had a heck of a time getting it all hooked up. I spoke with their customer support and think I finally have it figured out, but I have refrained from making any changes to my website because it could potentially bring the site down for a small amount of time. I really think I can get this done in March, so I’ll do my best to make that happen. Other than that, all I do for this website is publish 3 articles per week. Consulting Update: I had a little bit of consulting this month. It wasn’t much, just a one hour session with a new client and 15 minutes with an old client. I’m excited about the new client because he has a pretty solid website with lots of traffic, he’s just trying to optimize for earnings and after our first call he was able to very quickly see a jump of about 30% in Adsense revenue based on my recommendations. He has a good plan moving forward based on our discussion and he may get more consulting hours in the future. Udemy Update: Udemy earnings were down this month and my thought is “meh”. I personally am not a huge fan of selling my courses at a discount and don’t really want to try to convince people to buy courses any longer, so I guess I should be happy I got anything from this platform. OneHourProfessor.com Website Update: Two courses were sold this month and an increase in Thrive Themes sales made this a great month for the OHP website. I have plans to do some more review-type posts in the future for a few new products I’ve grown to love that will hopefully increase my overall earnings, but that will take some time to complete. Authority Website THQ Update: The THQ Authority Website is really starting to show some promise and although the income isn’t there yet, I’m really pumped about what I’m seeing. As I mentioned in my previous income reports, right now the focus is on traffic/links and THQ is growing significantly in that regard. My hope is by that time I’ll be hitting around 100,000 visits monthly, but only time will tell. The sessions for the month increased by about 60% which is awesome considering I am adding very little new content. In fact, all that I add each week now is one article. The gains that I am seeing here are because of the links I am getting to the website and the domain authority increase which is increasing my overall rankings in Google. Referring domains (backlinks) increased by 56% MoM and I’m thinking that I should be able to achieve this growth rate for the next few months as my link building campaign isn’t close to done yet. I said in February that I thought this website could yield income of $150+ and sure enough, I was able to make $160.48. This includes earnings from Indeed.com and Google Adsense, but as traffic rises we can expect these numbers to rise as well. I’m hoping in March to hit $200/month which would be amazing because I am not fully monetized yet. I’m not going to lie, I’m beginning to get really worried about the BCC website. I have roughly 55 links from other websites (reciprocal mostly, but I’ve applied a nofollow tag) and I am seeing almost no movement in the search engines. The table below shows what Ahrefs is seeing, so maybe Google hasn’t seen all of the links yet. Sessions decreased by 34% for the month. Obviously, this sucked but I guess it makes sense because I stopped my email outreach which was bringing some false traffic. However, I really expected a spike in traffic and am not seeing that yet at all. Referring domains (backlinks) increased by 50% MoM. The actual number of backlinks I have is 55, but Google may not see those yet. I have two thoughts here as to what is happening. First, is the idea of the “Google Sandbox”. This is something that many people swear by and basically says that in the first 3-6 months, nothing will happen to a website regardless of how hard you try. This is because Google effectively penalizes new websites to minimize your chanes to rank highly. I really haven’t bought into this theory before, but this website might change my mind. Second, is the fact that all of the links I got were reciprocated. This means I linked to them first and then they linked back to me after I reached out to get a link. The important thing though is that I nofollow’ed all of the links, so technically it shouldn’t have been seen as a negative. We will see if that changes in the future, only time will tell. For now, I am going to continue to publish four articles per week and just hope that Google starts to give me a little more love as the months go on. If it doesn’t, I’ll have to look into building more links as I refuse to abandon this project as I know it can do well. I am starting a news website in a specific niche and have a partner to help me with the project. As of now we are figuring out the design of the website and logo, but we’re also working on getting the correct writers in place so that we have plenty of content every single day. There are a whole lot of moving parts and this is a website unlike anything else I’ve ever started. I’m sure I will learn a lot along the way, but as of now we plan on using Facebook, email marketing, and SEO to grow the website. We see the viral concept of social media being a huge part of how this website and with a consistent publishing schedule, we think we can grow pretty quickly. We are going to start with one post per day and then plan on expanding to two posts. Once we have the hang of it and have seen how the website can grow, we will be expanding to three or more posts on every day of the week. Our monetization idea for now is Adsense, but it may change in the future. I will update as this happens to let you all know how it goes. Google Sandbox Might be a Thing: For a very long time I rolled my eyes each time someone mentioned Google “Sandbox”. I considered it fictitious and really didn’t believe in it at all. However, now that I’m experiencing no movement on the BCC website, I’m starting to think it might be real. That being said, I really hope it’s not because it’ll put a huge damper on my future plans with websites as I have two in the queue for 2017 that are similar to BCC. We’ll see what happens, but so far I don’t like the lack of progress. Adsense is a Good Business Model: Though my income doesn’t reflect the true worth of my THQ authority website, things are looking good for this website. Some of my key pages continue to increase in rank and I continue to get great backlinks which keep getting me more traffic. Many people say bad things about Adsense and say it’s a low form of monetizing a website, but I’m very happy with what I’ve seen so far and it’s extremely passive. Adding a SSL Certificate will increase traffic: In December, I changed the JFFHUB URL so that it would be secure. In other words, instead of HTTP, I changed it to HTTPS. By doing this, it increased my traffic since then by 23%. I’m not saying that this will happen for every website out there, but it worked for me and I’ve heard positive things from other people as well. I started it….then technical issues caused me to stop. I hate that I keep dragging my feet on this, but it’s a scary thing to make such a big change to a website that is essentially paying for your living expenses at the moment. Even with the short month, I was able to get 25 backlinks. I’m psyched about this, it means I almost got one per day. How awesome is that? I didn’t completely fail on this one, but I also didn’t succeed. I created a few autoresponders, but I wanted to really understand what my visitors need so I created an email that opens up a dialog. I’ve had a few discussions and now I know what’s needed, so I’m going to use that knowledge on my autoresponder moving forward. I HAVE to do this in March. Really….it just has to happen. I found out I can use Ezoic for free and serve Adsense ads through it, so I may set it up and start there. I figure I hit 25 links in 28 days, so let’s try to increase the links in March to 30 out of 31 days. It’s a stretch, but I’m going to try to reach out to more people per day. In February I would reach out to 50 people per day, in March I will try to reach out to 75 people per day. This should increase my responses and total links acquired. Now that I understand what my visitors need for my THQ website, I can create an autoresponder that really helps them. One big part of this is that I need a writer to create some very specific content for the autoresponder and I also need to get my developer to help with this, but I think I may start the simple part of the autoresponder to get things moving. That darn pop-up scared the *^@#$% out of me! Hey Ron! Its good and encouraging to see your income grow steadily as time goes by! I’m just curious on why your quite successful jobsforfelons site generates so much more income than this site. Shouldn’t the adsense earnings from this site also be quite high? JFFHub does really well because that’s the main part of the business model. OHP I barely have any ads and make some small amounts of money in affiliate income and course sales. It’s funny how both of us pretty much only had income report posts for the past couple months on the blogs of our sites. I’ve been working hard on my income producing sites (as have you obviously), but I sometimes feel guilty about not producing any content as my plan was to share all of my money-making experiments and things like that. Also, how effective is your online course funnel? Seems like the “presale” page is quite long and then you do a free course to a paid promotion after? Thanks for the comment. I also have the same guilt at times, but then I just look at where the biggest ROI of my time is and I stick to the income reports and other projects. It’s unfortunate I have to do this, but it’s just the way it is. My course funnel isn’t extremely effective, but I also haven’t pushed too hard on making it work. Truth be told, if people want my course and trust hat I have to say then I let them get it. If they don’t want to invest n themselves or don’t trust me, so be it. I don’t want to be one of those people who works only to get people to purchase a course I made. That being said, some people do want to be that type of business owner and I think it’s just a matter of preference. I guess that makes sense. 80/20 principle and whatnot. Interesting point. So you’re taking a sort of “build it and they will come” approach? Really, I took a “frustrated ex-Udemy instructor” approach lol. I started making courses for Udemy and after I couldn’t stomach the fact that most sold for $10, I decided to put them on my own website. I don’t think building a course for the sake of having a course s worth it. If you decide to go that route, you need to really concentrate on it as a money making endeavor and try to make it your “thing” with your business. For me, I just decided that building websites was more of my passion and more fun. That being said, I may start trying to sell courses again one day but I have no plans to do so at this moment. I was excited to see that Ezoic has a plugin! Oh, by the way, from one blogger to another, the keyword phrase “Ezoic plugin crashed my site” – you were on page 1 – nice job man. Anyways, the Ezoic Integration Plugin keeps on crashing my site. I have never had a plugin crash my site before – what is going on? I contacted their support but the response is not swift enough, so, here I am. All I did was install and activate and boom my site was down. Adsense won’t approve my site. It was getting too much non -tier-1 traffic. I am currently fixing that and now USA is on the #1 spot for traffic. However, adsense also says my content violates their policies. They are mental!! I expose online scams, how is that violating anything? Anyways, I was hoping Ezoic was the way for me – now I see they are as impossible as all the rest. I hope to hear back from you Ron on possible fixes for this. Also your suggestions to adsense alternatives because my site is getting 15 thousand plus a month and its time I monetize for real. I earn affiliate commissions but I so desperately want to maximize for potential revenue. Also, I hope you are not one of those bloggers that never gets back to their readers. So I am really hoping you will respond Ron.